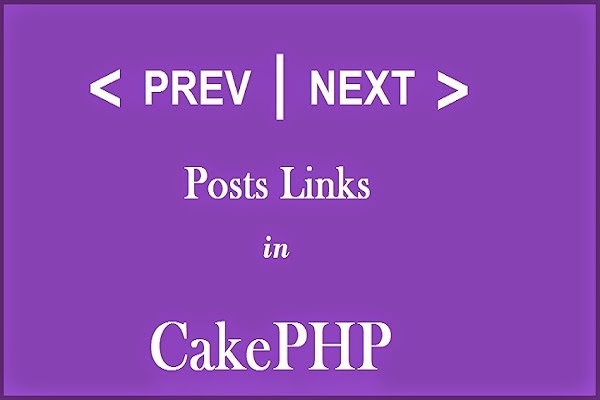 There are many methods for retrieving your data in cakephp varying from simple find all to complex joins. CakePHP has many useful find type which makes the data retrieval process very easy without writing manual queries to fetch the data. To achieve the same goal, CakePHP has one concept called 'neighbors' that we're going to see in detail - syntax , how to use , advantage etc. Using this concept you can show next previous link for posts. find('neighbors') is very similar to the simple find('first') query, only difference is it returns the row before and after the one you requested. will return the following output. which will return the following output. as you can see that it returns the row before and after the one we requested(3 here). A well known simple blog example code for the view function is as below. (1) Put the back button to go back to the listing page and then view the desired record. (2) Type the record's view URL directly in the address bar. But both of the above cases are not good enough. Instead of this there should be two buttons for the Previous and Next using which you can switch the records view. So this can be done using the neighbour concept. To implement this functionality make the following changes. That's it!! you have working neighbors() concept implemented. Now you can switch the record view with single click.